Kingtale2.inspsearch.com is the PUP that uses misleading techniques to prevent removal. Use Reimage to locate malicious components and get rid of them faster than with uninstall instructions. A full system scan blocks virus reappearance and prevents traffic to malicious domains. Is it possible to stay away from the browser hijacker? How should you get over with the Kingtale2.inspsearch.com removal faster? Changing the homepage or a default search engine should be purely a matter of one’s personal choice, but Kingtale2.inspsearch.com virus is willing to take that freedom away from you. 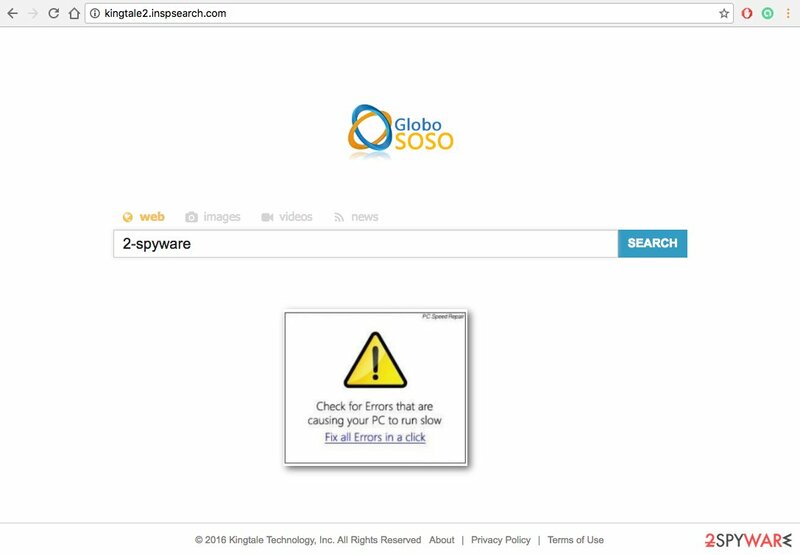 This suspicious search engine does not ask whether you want to use it and will simply start loading every time you open your browser. To make matters worse, this clingy domain will take over all of the browsers installed on the computer and will keep bouncing back to them even after the browser settings are altered. This is a solid base for the computer experts to deem Kingtale2.inspsearch.com a browser hijacker. In other words, it is a potentially unwanted program that enters users’ computers by deception and advertises third-party content through a bogus search engine it self-willingly assigns as the browser’s homepage. Helper objects such as toolbars, extensions, add-ons or quick search tabs also help to maintain the browser hijacker on the browser. If intrusive, deceptive or even dangerous online advertising is not what you are willing to deal with while surfing the net, you should act quick and remove Kingtale2.inspsearch.com from your computer. Scan your device with Reimage to automatically locate where this PUP is hiding and remove it from your computer along with the helper objects it may have installed along. This malware does not only target your right to the freedom of choice. It may also be a hazard to your computer health. The reason for this is the Kingtale2.inspsearch.com redirect tendencies. Simply said, while browsing via this engine, you can never be sure what happens next: some innocent-looking ad may send you to some shady gambling sites and shopping online can end up in a detrimental tech-support scam. Thus, trusting this website is the last thing you should do. Also, keep in mind that browser hijackers often collect information about their users, and you can expect that from the Kingtale2.inspsearch.com hijack as well. In fact, the program creators admit to collecting non-personally identifiable information, such as computer’s IP address, search queries and most visited websites to provide a better service. Nevertheless, you can never be sure if among this non-personally identifiable information some of your personal details will not be exposed too. That’s just one of the reasons why you should carry out the Kingtale2.inspsearch.com removal. If you are not infected and want it to stay that way, please read the following section where we explain how to keep browser hijackers at bay. Of course, it possible to keep your computer protected from the browser hijackers. However, if you regularly browse online, there is always a risk to get infected. Such sneaky infections infiltrate computers rather easy. In fact, the users install browser hijackers themselves. Although unknowingly, they agree making the Kingtale2.inspsearch.com the default search engine and homepage when installing other free programs on the computer. Such covert agreement is usually given via “Quick” or “Recommended” settings which only ask for permission to install the whole software package but not its individual components. The installation can be sectioned with the help of “Advanced” or “Custom” settings which allow the users to inspect the software package and choose to install the programs he/she really trusts and needs. It does not matter if you have downloaded the Kingtale2.inspsearch.com virus willingly or it has sneaked into your computer completely without your knowledge, it is important that you remove it. Unlike what most users think, the Kingtale2.inspsearch.com removal is quite a fast and easy procedure. Of course, having a few useful tricks up your sleeve can make the elimination even quicker. For instance, if you are getting rid of the virus manually, you can use the instructions provided by our experts and avoid errors. Also, you may use automatic antivirus utilities and reduce your own participation in the whole process to the minimum but still successfully remove Kingtale2.inspsearch.com from your PC. Here, look for Kingtale2.inspsearch.com or any other recently installed suspicious programs. Wait until you see Applications folder and look for Kingtale2.inspsearch.com or any other suspicious programs on it. Now right click on every of such entries and select Move to Trash. When in the new window, check Delete personal settings and select Reset again to complete Kingtale2.inspsearch.com removal. Once these steps are finished, Kingtale2.inspsearch.com should be removed from your Microsoft Edge browser. Here, select Kingtale2.inspsearch.com and other questionable plugins. Click Remove to delete these entries. Now you will see Reset Firefox to its default state message with Reset Firefox button. Click this button for several times and complete Kingtale2.inspsearch.com removal. Here, select Kingtale2.inspsearch.com and other malicious plugins and select trash icon to delete these entries. Click Reset to confirm this action and complete Kingtale2.inspsearch.com removal. Here, select Extensions and look for Kingtale2.inspsearch.com or other suspicious entries. Click on the Uninstall button to get rid each of them. Here, look at the Homepage field. If it was altered by Kingtale2.inspsearch.com, remove unwanted link and enter the one that you want to use for your searches. Remember to include the "http://" before typing in the address of the page. Now you will see a detailed dialog window filled with reset options. All of those options are usually checked, but you can specify which of them you want to reset. Click the Reset button to complete Kingtale2.inspsearch.com removal process. This entry was posted on 2016-09-13 at 00:41 and is filed under Stealing programs, Viruses. You can quickly scan the QR code with your mobile device and have Kingtale2.inspsearch.com virus manual removal instructions right in your pocket. How did you remove Kingtale2.inspsearch.com virus?